For the 15th year running, solicitors, estate agents, surveyors and the PSPC ladies themselves once again had a fantastic night competing on a host of general knowledge topics at the Salutation Hotel in Perth. The annual quiz has so far raised almost £9,000 for the charity, based in Perth Royal Infirmary. The winning team was Miller Hendry, with Neil Whittet’s team coming second. The hosts, PSPC, were delighted to come third. John Watson, Chairman of Hospital Radio Perth and quiz-master said, “It was another fabulous night and once again the competitors dug deep to support us – not just in entry fees and buying raffle tickets – but–in supplying most of the raffle prizes too! The PSPC quiz funds will help keep the award-winning station broadcasting 24 hours a day, 365 days a year to the patients of Perth Royal Infirmary. 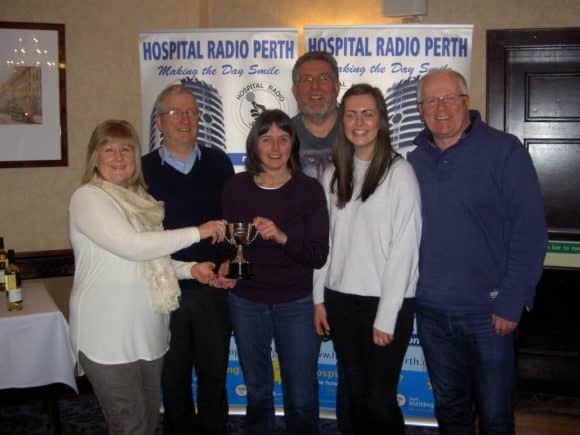 Hospital Radio Perth, which is supported by a team of 35 volunteers, has been hailed the top hospital radio station in the UK four times in 20 years, more than any other of the 230 UK stations. For more information or to listen in, visit www.hrperth.co.uk.